You’ve decided to go to a local career fair. Good choice! Unemployment is low right now, so it’s a good time to be looking for work. But what are you going to when you get there? The scene can be overwhelming if you’re not sure what happens at a career fair. Standing in the middle of a crowded room and waiting for someone to offer you a job isn’t going to get you very far. 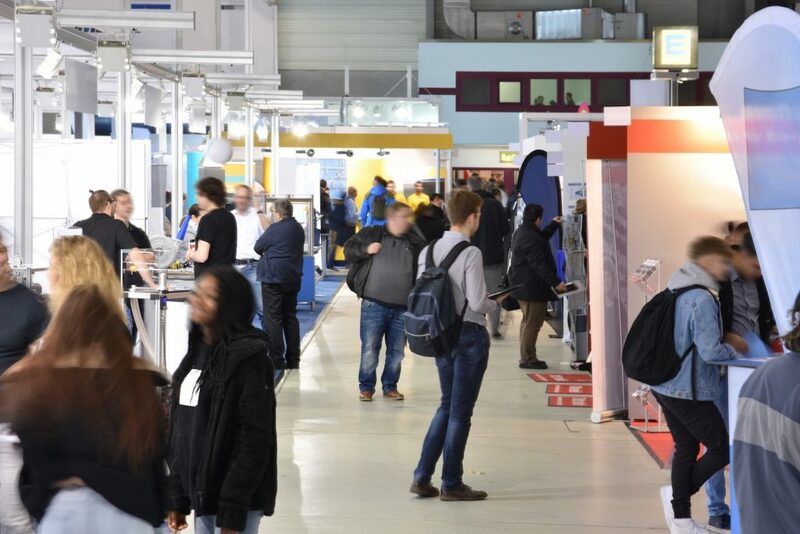 Depending on the size of the career fair, there could be anywhere from a few dozen to a few hundred recruiters stationed at booths waiting to talk to prospective employees. If you could read those recruiters’ minds, here are some things they’d like candidates to know about career fairs. If you want to know how to approach a recruiter at a career fair, remember to be friendly without being creepy. Making eye contact when you approach the table is good, but if you can’t muster up a genuine smile, a friendly, focused look works better than an over-the-top clown grin. Pondering what to say at a career fair? Have two or three questions in your back pocket and ready to go, but make sure they’re appropriate questions like “What is your company culture like?” Such questions show that you’re not just looking for the first place willing to hire you. Avoid questions like “What do you guys do here anyway?” Recruiters have heard a variation of that one hundreds of times. It shows you haven’t bothered with the most basic research into what the company does or why they might be a good fit. If the job fair lasts all day, you may think that going in the afternoon is best for your schedule. But if you can get there earlier, do so. Recruiters are like any other worker: They get more tired and worn out as the day goes on, and that’s especially true once they’ve been talking to job seekers and answering questions for hours on end. Going early helps ensure you’re talking to a recruiter who is still fresh. Don’t linger too long at one table, either. Make a list of five or six recruiters you really want to visit, and then stick to it. Picking up a few company-branded pens or office supplies is perfectly fine, but don’t ask for extra swag. Recruiters want to meet people looking for jobs, not people who are going to a career fair because it’s easier than heading to an office supply store. You should come up with a brief introduction that mentions your skills and the kind of work that interests you, but recruiters will understand if it’s not a perfect elevator pitch. However, if you’re only there for the swag, or if you’re trying to get a date rather than get a job, recruiters will know. They can tell genuine interest from someone who is just killing time or there because their mom made them go. That’s a bad idea anywhere, but it’s an especially bad look if you live in a particularly competitive job market. We can help job seekers stand apart. In fact, we’ve been doing it for years via free career fairs. It’s common to wonder if career fairs are worth going to. They are when we’re involved. Just ask some of our satisfied corporate clients. We’d like to earn your trust the same way we earned theirs. Come to one of our careers fairs near you.